The insouciant beauty of poppies is nothing if not uplifting! Our Poppy Garden Embroidery project taps into the wild whimsy of these wonderful flowers, using the same beautiful design to make two totally different Samplers: an Appliqué Sampler with colorful wool felt blooms and embroidered details and an Embroidery Sampler with exquisite detail and poppy-like delicacy. This Pattern walks you through both Samplers and includes three sheets of iron-on Transfers, plenty to make both Samplers and to practice and sow poppies everywhere! For a list of materials you'll need to make your Poppy Garden Embroidery, click Product Details, above, and please note that the Pattern + Transfers are only available as a hard copy. Two 18 x 26-inch pieces of woven cotton or linen. We used Purl Soho’s Daily Linen. Eight 6 x 9-inch pieces of 100% wool felt. A Wool Felt Bundle includes eight 8 x 12-inch pieces. Note: Three sheets of iron-on transfers are included with the Pattern. 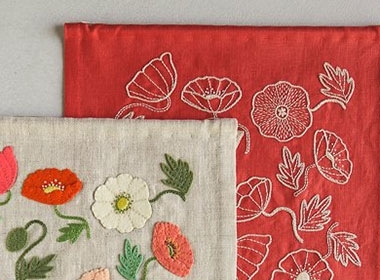 Another option: All of these materials, including the Pattern, come in our Poppy Garden Embroidery Kit.